The director of USC’s Annenberg School of Journalism will deliver the 44th Hays Press-Enterprise Lecture at UC Riverside. RIVERSIDE, Calif. – Longtime journalist Geneva Overholser, now director of the Annenberg School of Journalism at the University of Southern California, will deliver the 44th Hays Press-Enterprise Lecture on Monday, Feb. 13, at 7:30 p.m. in University Theatre. Her topic is: "Better Days to Come: Seeing the promise in journalism's upheaval." 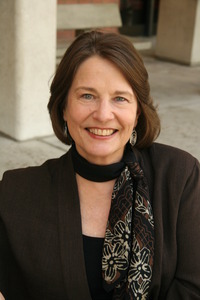 Overholser is the first journalist invited to return as the Hays lecturer, having spoken previously in 1992 when she was editor of the Des Moines Register. “An astonishing amount of change has occurred in the journalism world in 20 years, and I will be drawing on that as I return to this important podium,” she said. Overholser was editor of the Des Moines Register from 1988 to 1995 and led the paper to a Pulitzer Prize for public service. While there she also was named Editor of the Year by the National Press Foundation and “The Best in the Business” by American Journalism Review. She has served as ombudsman of The Washington Post, editorial board member of the New York Times, and the Curtis B. Hurley Chair in Public Affairs Reporting for the Missouri School of Journalism. She is on the boards of the Knight Fellowships at Stanford University, Center for Public Integrity, Committee of Concerned Journalists, Academy of American Poets and examiner.com. She served on the Pulitzer Prize Board and was an officer of the American Society of Newspaper Editors. She is a fellow of the Society of Professional Journalists and the American Academy of Arts and Sciences. She also held a Nieman fellowship at Harvard. The event is free, but reservations are requested by Feb. 8 and may be made online at emp.ucr.edu/hays_lecture/, by calling (951) 827-3144 or by emailing alyssa.oates@ucr.edu. Complimentary parking will be available in Lot 6. The lecture series has long been a distinguished forum to address issues in journalism and the media, said Nels Jensen, editor and vice president/news of The Press-Enterprise. "When Geneva gave the Hays lecture 20 years ago, she spoke about the need for news organizations to fulfill our watchdog roles and develop a thick skin to criticism and public opinion. She was sure right about that,” he said. “So it will be interesting to see how she views journalism for the next 20 years." The Press-Enterprise Lecture Series was begun in 1966 by Howard H (Tim) Hays, then editor of The Press-Enterprise, in cooperation with UCR. Upon the sale of the newspaper in 1997 to Belo Corp., his son, Tom Hays, endowed the lecture and the Hays name was added to the title in honor of Tim Hays. Belo Corp. and A.H. Belo Corp. have also contributed to the furtherance of the Lecture Series. Previous lecturers have included columnists James Reston and George F. Will, NBC board vice chairman Richard Salant, Washington Post publisher Katharine Graham, CNN President Tom Johnson, and Karen House, retired publisher of the Wall Street Journal.